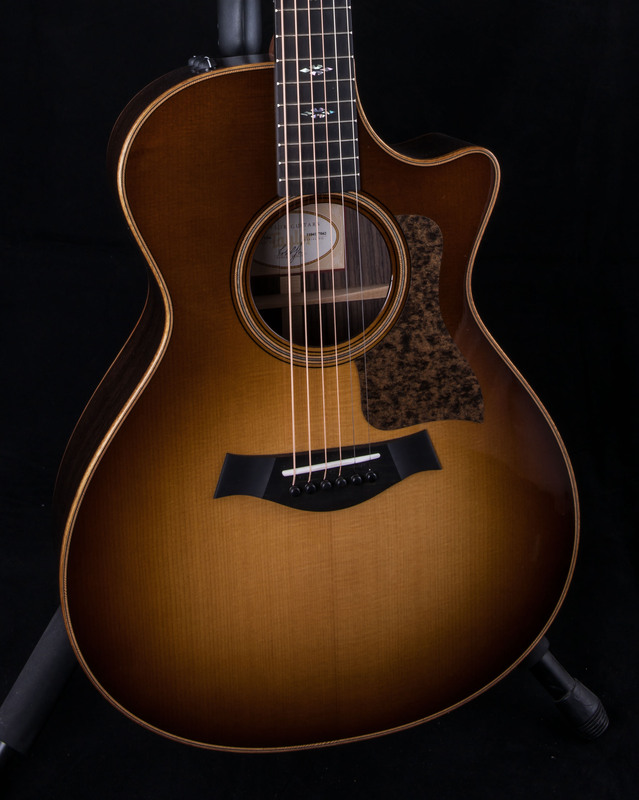 The rosewood and Lutz spruce 712ce pairs Taylor’s cutaway Grand Concert body with a shorter-scale 24-7/8-inch neck for a physically compact and intimate playing experience. The neck’s slightly condensed scale length makes fretting chords easier and reduces the string tension, making it easier to bend strings. Fingerstyle players will love the Grand Concert’s responsiveness together with the articulate sonic detail of the rosewood/Lutz spruce wood combo, and the Venetian cutaway offers more room to play up the neck. Wood-rich aesthetic details include Hawaiian koa binding, a herringbone-style rosette featuring Douglas fir with maple/black accents, and bias-cut Douglas fir top trim, while a new “weathered brown” pickguard design complements the earthy color tones of the rosewood and wood trim. Taylor’s onboard ES2 electronics add a pro-grade pickup and preamp for impeccable amplified acoustic tone.